During most of the press junkets for this film, Matt Damon was posed a similar question time and time again, always revolving around the Chinese epic’s supposed whitewashing of the lead role. He routinely answered like a pro, informing the interviewers that whitewashing a role would mean a white performer took the place of a character originally meant to be of a different ethnicity. Think John Wayne as Genghis Khan, Chuck Connors playing Geronimo, or Scarlett Johansson in the upcoming Ghost in the Shell. This is not whitewashing. 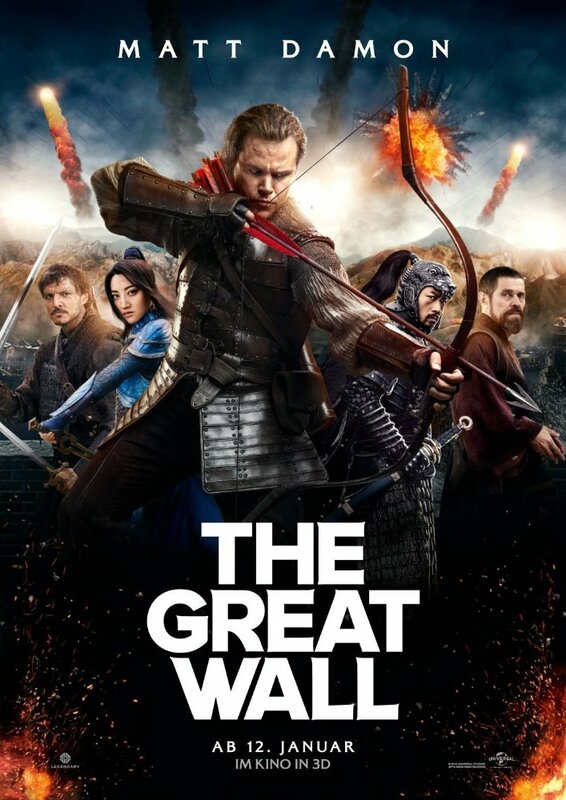 Has The Great Wall been poorly marketed as such? Certainly, but it doesn’t deserve these racial epithets, and that’s why you have to see the movie for yourself. It’s enormous, brisk, and a joint collaboration – both on the screen and off – of Western and Eastern ideals coalescing as one. The Great Wall of China is said to have protected its people from known threats and from legends. As a straight-up monster movie, this one definitely falls firmly into the latter, excelling with sheer scale and visual imagination. As for the human element, we’re first introduced to the haggard William (Matt Damon) and his band of mercenaries. He’s fought for many nations and many flags, not out of patriotism, but to ensure wealth, prosperity and a full stomach. These common factors drive his men to hunt for the weapon called black powder, all while being chased down by bandits and attacked by a creature in the dark. 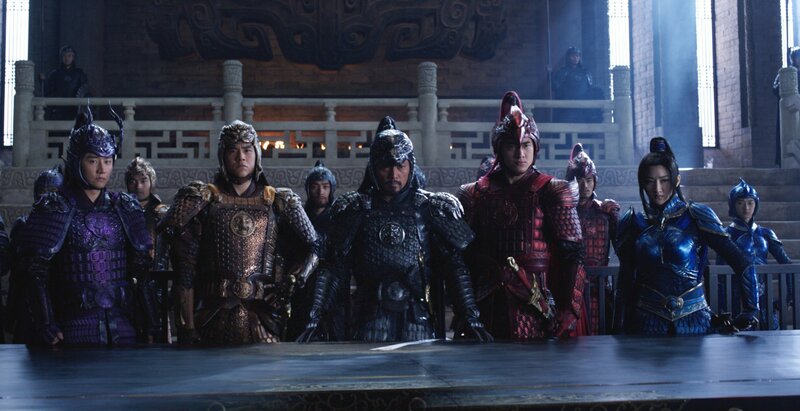 Only William and his closest confidant Tovar (Pedro Pascal) make it out alive, stumbling upon the wall and seeking refuge inside the fortress from a secret army known as The Nameless Order, led by General Shao (Zhang Hanyu) and his second in command Lin Mae (Jing Tian). The Great Wall is not a very serious film. After all, it’s based on an imaginary legend and embellishes the sheer magnitude of the structure to match its overwhelming ambition. But seeing two light-skinned men standing before the wall, with the superhero looking Easterners gazing down at the troglodyte appearances of more primitive Westerners pleading to be let in, stands as a sharply political statement. I’m not sure that was the intention, but it is a counterpoint message for audiences, at least from an American point of view. As such, the two men are treated like heathens, only to quickly gain the Order’s attention after showing them the dismembered claw of a creature. It belongs to a Tao Tei, and it signals the army that their enemies are arriving sooner than expected. These Tao Tei attack once every 60 years – serving as a reminder of a previous Emperor’s greed – and as is typically the case, operate like a colony of ants. Countless beasts attack and return food to the Queen. Without her, they are rendered useless. Comparatively speaking, this piece of The Great Wall sort of resembles Paul Verhoeven’s monsterpiece Starship Troopers, just without much of the subtext or the satire. 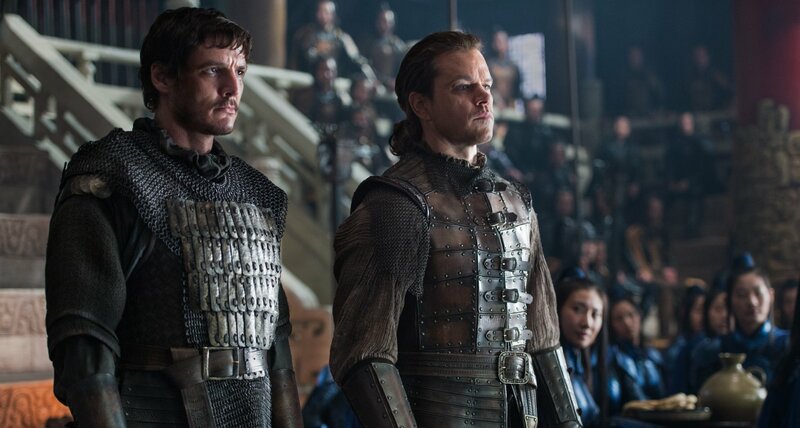 As so many blockbusters do, The Great Wall loses its focus in the final act and opts for a lot of bang-bang conclusions rather than one operatic finale. It’s detrimental and sends us off on an unfulfilled note, especially a wasteful character played by Willem Dafoe who needed gutted as well as the horrendously CGI rendered monsters. But up until that point, almost everything else about this movie can only be registered on a freight weight scale. It’s the biggest production between American and China. 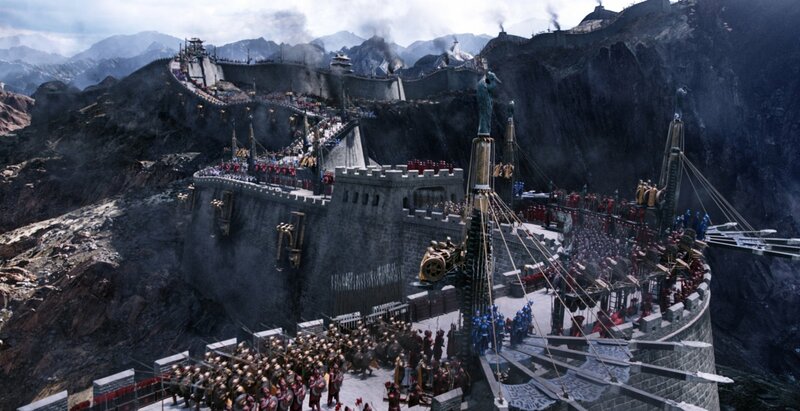 Visionary director Zhang Yimou – who sets up some absolutely gorgeous shots – used the largest green screen ever built. The production design developed an exaggerated world, the costuming decorates a militia with style and color, and the behind the scenes cooperation between such a diverse crew was a momentous effort to pull off. So I ask that you give this romp a chance. Push aside the senseless backlash and watch a mammoth of movie made by an artist who simply wants to entertain without pandering or condescending. See The Great Wall for what it is: a bountiful banquet of beasts and a wild feast of spectacle, all with a teeny tiny house salad of dutiful fraternity on the side.